Said my favourite antiquarian at the beginning of my graduate studies at the University of Münster with a prompting undertone. That was in 1992 and it was my entrance to the antiquarian business. Of course the piles didn’t get smaller but I had secured a reliable source of books and found a job that became the profession of my dreams. From this day on I perked up my ears and opened my eyes and was initiated into the secrets of purchase, evaluation and collation of books. The love of books that had already got hold of me at my school days finally became bibliophilia when my boss suddenly had to sell his shop due to illness and asked me to take over the business. At that time my exam preparations were in full swing and after a short consideration and longer negotiations with the bank the shop keys were handed over to me. I jumped in at the deep end of accounting and tax declaration. After the Master’s exams (Philosophy, Psychology and German Studies) and the festivities associated I began to concentrate on the antiquarian business and put out feelers to the environs of Münster. 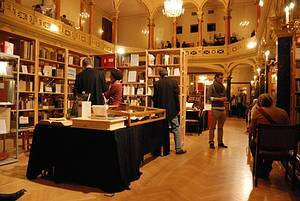 This was followed by the first antiquarian book fairs in Bochum, Düsseldorf, Cologne, Hamburg, Ludwigsburg, Berlin and by collaborations at international fairs in London, New York and San Francisco. At first I thought that the internet platforms were only of use to sell the exotic titles, but soon I realised that this distribution channel had become a mass market and an important new component of my profession. Despite or rather because of these developments I am attached to my shop and I enjoy exhibiting at book fairs. 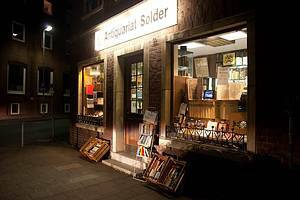 While these changes were going on another medium took over my antiquarian book shop: Television or rather the German crime series “Wilsberg” (read more here), that is still being shot twice a year partially in our shop as it also has been for the past decade. This page is wants to keep you informed about our shop, our presence on book fairs, in the internet and on television. In addition we want to arouse and promote your curiosity for rare books. This website was developed in cooperation with B.C. Richter (layout, portraits and background images) and with HTMfactory® (conception and programming).